Propertymart is a name to reckon with in the Nigeria real estate sector. Well known for its cutting-edge exquisite design and seamless execution of all projects. The company has made significant impact in the evolution of modern day. leaving no stone unturned in ensuring that it becomes the most exquisite estate in Nigeria. The estate has an exclusive collection of house typologies, each in a class of its own. Thereby offering an elegance of its own. Residents that are living inside Micheville Estate are highly happy to live in this beautiful estate in a high brow area. Mitcheville Estate is located in Lokogoma Abuja, 23 minutes from International Conference Centre (ICC). There are other beautiful estates and good edifices at Lokogoma. These area has very good road network. 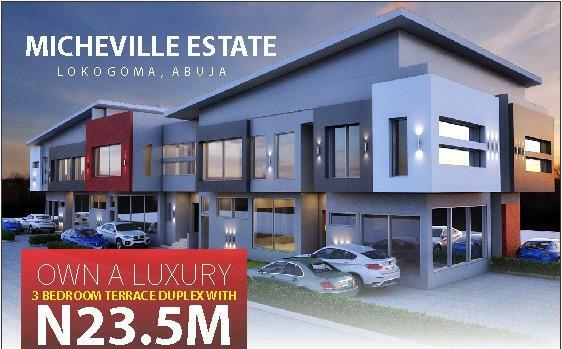 The luxury 3 bedroom Cranbel Terrace Duplex is within micheville estate Abuja. It’s layout and design gives ample access to every corner of the building, such moving within the house totally fluid and effortless. spacious pent- house accessible via the double – volume masters bedroom. Finishing to be done by Propertymart: Exterior of building will be fully completed and painted. Aluminum windows and fixed pipe works done, Building will be roofed. All glass windows fixed. Building will be fully plastered externally and internally. Entrance and exit doors fixed. Staircase without hand rails will be done. Finishing not to be done by Propertymart so clients can expressed their taste: Sanitary wares, taps. Burglary proof on the windows. POP ceilings. Inner doors. Tiles and floor finishing. Electrical cables and fitting. Kitchen Cabinets. Tiles, interior painting and inner doors. All the existing duplex unit has been paid for, company is building more units as off plan project which will be completed within 7 months. 6 Months Flexible Plan: N25.5million. Minimum Initial deposit N5m. The beauty of Micheville Estate will amaze you. This is opportunity for you to live or invest in an elegant environment. Don’t miss it.